Jean Renoir once said of Ernst Lubitsch (Ninotchka, The Shop Around the Corner, To Be or Not to Be): "He invented the modern Hollywood." 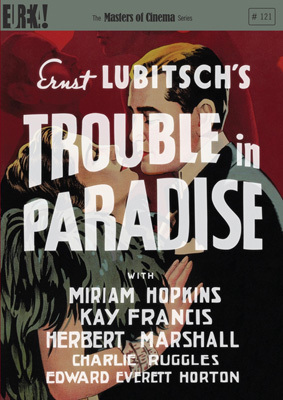 And none of the director's films has had greater influence or impact than Trouble in Paradise. With his first comedy of the sound era, Lubitsch created one of cinema's supreme visions of shimmering romance and worldly sophistication. A breathtakingly nimble and elegant examination of the perils of mixing "business" with pleasure, this gloriously adult and witty comedy features a peerless screenplay by Samson Raphaelson, effervescent performances by its stars (including Charlie Ruggles and Edward Everett Horton), and exquisite direction by the legendary Lubitsch. Described by Pauline Kael as "Perfection" and Empire as "The most sophisticated comedy ever produced in Hollywood," Trouble in Paradise makes its UK home viewing debut with a DVD release from Eureka as part of the Masters of Cinema series on 12th November 2012 at the RRP of £17.36.